I was reaching up to scritch my back last night, as I often do, and was surprised to find raised bumps that were super-tender upon being touched. I’m baffled — the last time I had anything rash-like was scabies in 2000 (homeless kids slept on a couch in my favorite coffee shop. I’m amazed I’m not scarred from the infection). Before that was my two bouts of chicken pox — one at age one, and a lighter dose at age seven or so. So I know my itchy rashes, and this isn’t any of them. 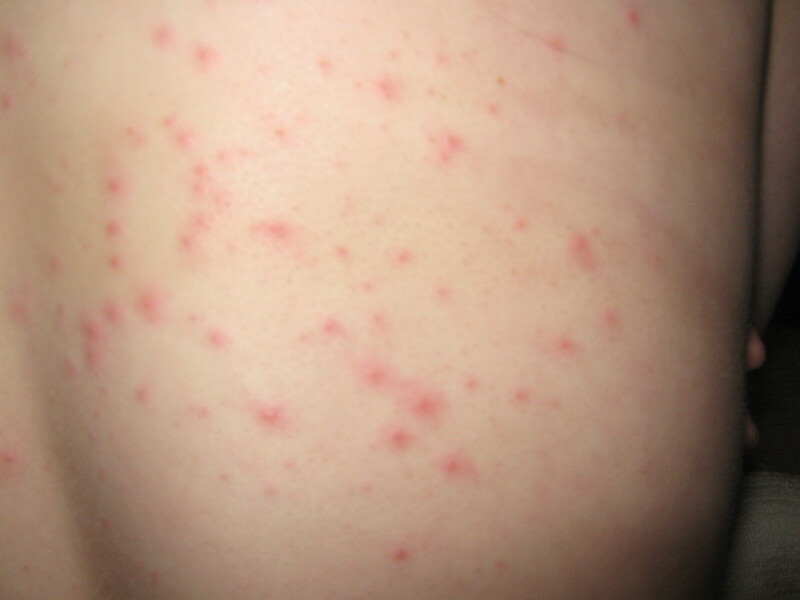 Hell, it’s not even itchy as of yet — it’s just there and red and spread. So of course, I googled. Extensively. And sicced my husband and one of my best friends on it. We found nothing, absolutely nothing. So I had the husband-fellow take some pictures to add to the pictures from last night, since chronicling a strange thing is probably a good idea. It had spread further across my back from last night (though not anywhere else that I can see), though still not containing any particular noticeable itching or oozing or the like. At a loss, I popped into the pharmacy downstairs. Quelle surprise, they didn’t have any idea either; I might very well have to book in with my doctor next week. 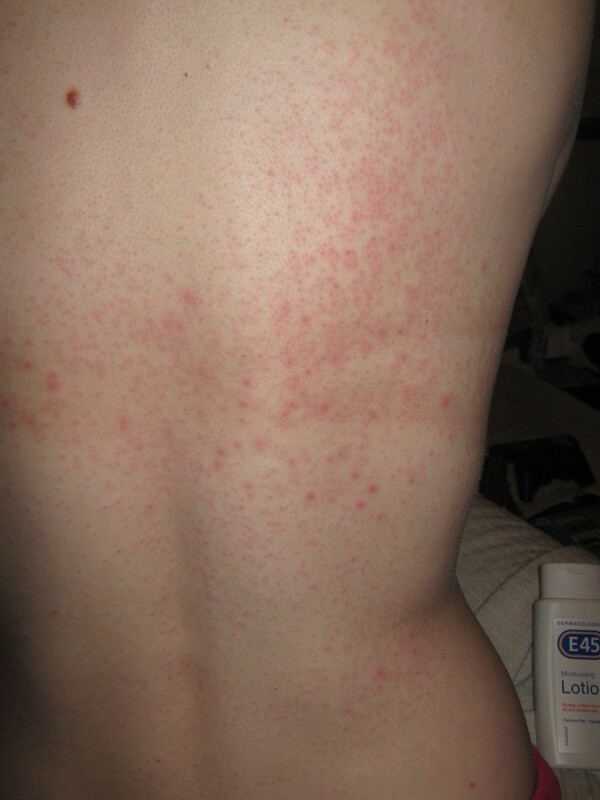 I’m not overly rushed because it’s not seeming to spread by contact (both my super-sensitive skinned husband and child were free of any rashing), we’ve not changed detergents or fabric softeners lately (and those are non-issue for me anyways), I’ve not changed meds, and as said — it’s not noticeably itchy or painful. But I’m still stumped. Having said that, everyone I’ve talked to has asked the million dollar question — ‘Have you been stressed lately?’ Well, yeah — I’ve had this mixed episode crap going on, and I have freely admitted that it’s taking a toll on me. But to flip that around, why on earth would I have a stress or anxiety rash now when I haven’t all those other years of mega-super-body-screwing stressed? I’m not saying it couldn’t be, but it doesn’t make much sense to me why it would suddenly happen if that were the cause. Has anyone else had any sort of experience in this regard? Anyways, ‘joy’… got to love it when bipolar’s little buddies anxiety, stress, and depression take a physical toll (NOT). I just hope it clears up sooner rather than later, whatever it is. I hope everyone else out there is having a good day. I need to bite the bullet and book in now that it’s come back. I will take this as a reminder to do that asap! I’ve never had it myself, but I have seen it once. It was an employee of mine who had heard a rumor that I was going to fire her. You could feel her anxiety from across the room and the rash spread around her body. She knew what it was, though, so it wasn’t like her first time, but it was exactly like you described. End of story, I didn’t fire her and never intended to. Thanks for posting! I have the same thing! !